The Anna is a PDF Pattern for a Case that will fit an iPAD 1, 2, 3, or 4 or a Kindle Fire 8.9. Included are instructions for a convenient offset zipper and a shoulder strap. The Anna is a PDF pattern with instructions to make a beautiful yet simple to construct "Anna" case. 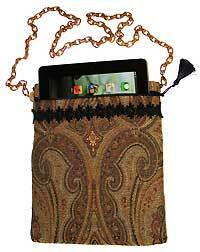 This pattern is padded and fully lined with a zipper closure and shoulder strap for your iPad, tablet, or Kindle DX! This pattern will fit your iPad, tablet, Kindle DX or any device up to 10.5" x 7.5" x 1/2" and is a little oversized to accommodate a device with a cover. If you have never installed a zipper, no problem! This method is extremely easy! 1/3 yard of fabric (consider pattern placement if fabric has a large, noticeable motif- you may need more fabric. 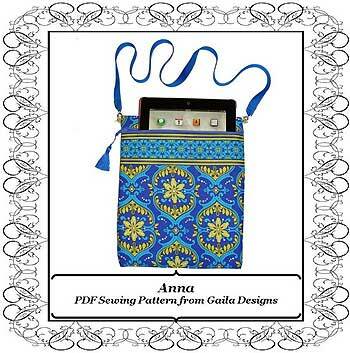 The Anna iPAD Pattern is in PDF format and has a total of 15 pages. There is 1 page of printing instructions, 2 pages of pattern pieces, and 12 pages of instructions and photos. If you would like to use this pattern to create cases to sell on Etsy or elsewhere, that is permissible. I would greatly appreciate a note of credit for the pattern source (GailaDesigns). Individual pieces sewn by you are wonderful, no mass production is permitted.